So believe it or not, some people still read for fun. Whether it’s reading biographies for information, fantasies to get lost in, or romances to imagine you were a part of, books are magnificent. I personally love fantasies and everything about them. Needless to say, I’m a fan of the Harry Potter series, but since I have finished them, I need something to fill the gap. Because of this, I have started a few series to see if there is anything out there that can come close to the adventures of Harry and his friends at Hogwarts. 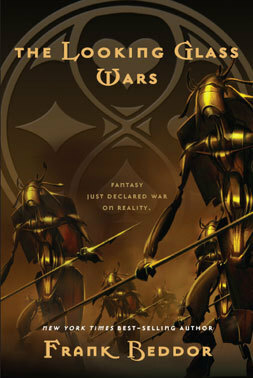 One of the series I started is Frank Beddor’s The Looking Glass Wars, the first book also being titled The Looking Glass Wars. It is a very interesting twist on Alice in Wonderland. I don’t want to give any of the story away, but I will give you a little taste. For starters, Alyss Heart is in the middle of a war against her Aunt Redd. Accompanying her is her personal bodyguard Hatter Madigan, her friend Dodge Anders, and many others. Loaded with plenty of suspense and drama, this book also includes numerous surprises that I didn’t see coming at all. This is a classic example of a true page turner that one can’t get himself to put down. To prove that, I was reading this during a very busy semester in college, one where I was averaging roughly 4 hours of sleep a night, and I was still finding an hour or so a night to put aside just to read this book and delve into the beautifully pieced together magical land that Beddor has created. It’s hard not to tell you everything about this book, but then there wouldn’t be much of a reason for you to go out and read it! If you’re a fan of fantasies, definitely give this book a read. I know I will be going to pick up the remaining books in the series so I can find out what happens with Alyss and her seemingly endless struggles. Overall 4.5/5.